Great caution and mountain experience are necessary on Klausenpass. It’s not just the narrow, lumpy road and vertical drops you have to worry about. Rudolf Caracciola at the wheel of a Mercedes-Benz SSK on Klausenpass in August 1930. Photo via Daimler.com. More later. You know you are in serious Switzerland when all the Audis melt away in favour of Subarus. The farmers-favourite Japanese manufacturer sells itself across the Continent as ‘Switzerland’s 4×4’ and this is the heartland. There’s a Subaru dealer in Glarus, on the north end of H17, the road which stretches between the A3 and A2 motorways in central Switzerland. Klausenpass is in the middle. Klausenpass is very narrow in places, and lumpy. Because of its motorsport heritage it attracts serious drivers. When we were there a blacked out Porsche 911 – suspiciously missing its front number plate – blasted past us on the long climb from the east. Coming down the other side, on an especially narrow stretch, flimsy guardrail separating us from the hundreds-of-feet vertical drop, a young lad coming towards us in a decal’d Subaru Impreza – naturally – was going so fast that when he jumped on the brakes the back end stepped out. Not far behind him, around a blind bend, was a tractor pulling a hay cart. At least he looked apologetic as he squeezed past. 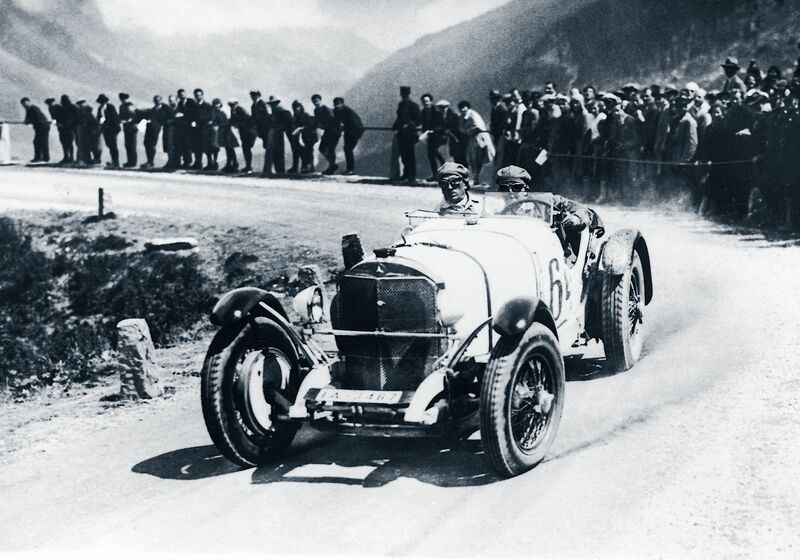 From 1922 to 1934 tens of thousands watched each year as the great drivers of the day tackled the Klausenrennen ‘Grossen Bergpreis der Schweiz’ the toughest, most dangerous hill climb in Europe. The course ran east to west, 21.5km from the centre of Linthal – a few miles along from Glarus – to the top of the pass through 136 curves and 57 corners. Then it all came to an end, thanks to the weather. The event went ahead anyway and, despite an avalanche across the road at one point, Rudolf Carracciola set the course record of 15:22.02 at the wheel of his 400hp Mercedes-Benz W25 Grand Prix car (an average speed of 84kmh). But the spectators had either drifted home or failed to turn up. The event lost £3,000 and was never run again. By the next year, Switzerland’s premier motor racing event was the Swiss Grand Prix at the recently opened Bremgarten circuit near Bern. Klausenrennen was revived in 1993 as a blue chip old timer event and has been run every five years or so since, the last time in September 2013. Many thanks to @156Sharknose for solving the mystery over the demise of the original Klausenrennen.